Summary coverage of the new connector and cable products that were recently released to market, including interconnects, wire and cable, cable assemblies, materials, accessories, tools, development kits, and other connectivity products. Supplier names are generally linked to product announcements and product names are generally linked to product pages or datasheets. New Connector and Cable Products: April 2019 > Interconnects, etc. Cinch Connectivity Solutions ’ new C-ENX™ Galley Connectors are designed and built to the ARINC 810 standard for use in commercial aerospace galley applications, including beverage makers, ovens, microwaves, refrigerators, chillers, and trash compactors, and are also standardized to EN4644. They feature stackable nickel-plated aluminum shells that provide weight reductions and mechanical protection and don’t require any additional space for locking and unlocking, modular inserts with interchangeable and intermateable parts that reduce manufacturing and operating costs, spring-floating mounting hardware that compensates for equipment and cabinet misalignment and supports blind mating, centered guide pins and sockets that further support blind mating, and standardized contacts that help ensure timely availability. They can also accommodate six power contacts and 24 signal contacts and can include a twinax connector for CAN data bus connections. In addition, like all C-ENX connectors, the new C-ENX Galley Connectors provide optimized stacking capabilities and space reductions compared to circular connectors, employ the same panel cutouts to reduce rework and complexity, enable field replacement, and require standard mil-spec tools for contact crimping, insertion, and extraction. Phoenix Contact ’s new FINEPITCH 0.8 Series board-to-board connectors have a compact, high-density design with 0.8mm-pitch hermaphroditic ScaleX contacts that provide critical space savings, high electrical and mechanical reliability, high tolerance compensation, and vibration-proof performance in high-speed signal and data transmission applications with significant space limitations, including telecommunications, building and industrial automation, and IoT equipment. They also employ a closed shielding mechanism that ensures excellent EMC, protects against EMI, and enables data transmission up to 16Gb/s. The connectors are available in five positions (12, 20, 32, 52, and 80) with 6–12mm stack heights, long wipe lengths, and minimum air clearance and creepage distances of 0.25mm, and are rated for 1.4A and up to 500VAC, operating temperatures extending from -55°C to +125°C, and 500 insertion cycles. They are also compliant with the RoHS and RoHS II directives, approved to UL 1977, and packaged on tape and reel for automated assembly. TE Connectivity ’s new series of Ethernet jacks with integrated magnetics and Power over Ethernet (PoE) designed to help to simplify PCB design and peripheral powering in a broad range of industrial applications. The jacks eliminate the need for any layout on the analog part of the board circuitry while still meeting system transmission requirements and, because they conform to the IEEE 802.3at (PoE+) standard, can be used to power devices up to 25.5W on every port. The series is built using a flame-resistant (UL94 V-0) liquid crystal polymer (LCP) material that can withstand high temperatures, which allows the jacks to be reflow soldered along with other components to simplify assembly and reduce costs, and features a three-wire choke that prevents coil saturation and minimizes interference between power and signals. The series also features 30µin of thick gold plating over 50µin nickel on the contacts for improved corrosion protection and higher reliability in harsh environments. The jacks have an extended operating temperature range, stretching from -40°C to 85°C and can tolerate 260°C reflow soldering temperatures. 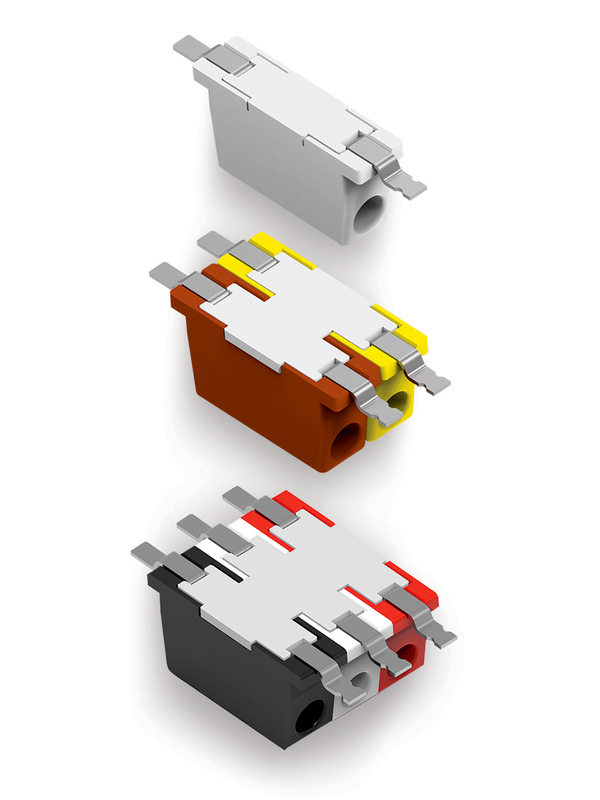 Molex extended its SlimStack range of floating board-to-board (BTB) connectors with new 0.40mm- and 1.25mm-pitch product lines that provide space savings, design flexibility, and a wide floating range in three different directions with a soft floating force. The new 0.40mm-pitch SlimStack connectors are one of the smallest floating BTB connectors in the industry and feature a low-halogen housing material, a ±0.50mm floating range that eases misalignment and facilitates automatic assembly, a maximum operating temperature of 125°C, and a high-speed transmission rate of 6Gb/s. The new 1.25mm-pitch SlimStack connectors are designed to enable easy assembly, prevent fretting corrosion, and deliver high vibration resistance. They are rated for 125V, 1A, and 10-cycle durability, and offer superior contact reliability compared to other options in the market, in addition to a smaller height and width. Ideal applications for the two new SlimStack connector series include automotive, industrial, and consumer applications. Samtec ’s new mPOWER™ connectors provide micro-sized high-power solutions with incredible design flexibility for power-only and power-and-signal applications. The new 2.00mm-pitch power connector system (UMPT/UMPS) is capable of achieving up to 18A per blade in a small form factor that’s about half the size of traditional power connectors that carry 20A per blade, allowing designers to free up board space for other components or minimize package size. It is currently available with 2–5 power blades and in stack heights spanning 5–12mm, and can easily be added to new or existing architectures alongside other Samtec high-speed connector systems — including the AcceleRate® HD, Edge Rate®, SEARAY™, SEARAY™ 0.80mm, LP Array™, Q Strip®, Q2™, and Tiger Eye™ — to achieve unique two-piece power and signal/ground solutions. The new series also features standard matte tin or 10µin gold plating and optional 30µin gold plating to meet specific regulations, two-stage mating power blades that can be selectively loaded to achieve any specific creepage and clearance requirements, and optional weld tabs provide increased stability on the board. In addition, several other mPOWER connectors are currently in development, including variants with up to 16mm stack heights and up to 10 power blades, a right-angle version with 2–10 positions, and a latching socket cable assembly designed to mate with both vertical and right-angle terminals in rugged applications. SCHURTER launched the first UL-approved IEC TS 62735-1 connector system: the new GS21 socket outlet and GP21 plug, which are rated for up to 400VDC and designed to enable a standardized global approach to DC power distribution in data centers, large-scale communication infrastructure, electric vehicle charging systems, lighting, and other devices. Complete DC power supply architectures bypass the cost-intensive, failure-susceptible, and wasteful transforming of AC to AC or AC to DC, improve the overall quality of the power being supplied, enable smaller designs with increased functionality, and eliminate problems with harmonics, harmonic distortions, phase compensation, and coupling synchronization to improve both operational reliability efficiency. The new IEC TS 62735-1 standard for DC power distribution requires a more complex design than traditional AC connector systems outlined in the IEC 60320 standard and, to ensure safety, requires connector systems to be designed with proper consideration for the increased potential for arcing when disconnecting the DC power supply under load. The next-generation standard, IEC TS 62735-2 for the development of DC connector systems rated for up to 5.2kW, will require additional structural elements including a safety interlock (cold switch). SCHURTER’s new IEC TS 62735-1 connectors, the GP21 and GS21, have a permissible operating temperature range of -5°C to +105°C and are available with quick-connect 6.3mm x 0.8mm or PCB terminals. The GP21 rewireable plug accommodates cable cross-sections spanning 18–16AWG and the GS21 socket-outlet offers mounting options for 1.5mm or 2.0mm front-panel thicknesses. Stewart Connector ’s new USB 2.0 Type-B connectors are small, robust, reliable, and economical, and are ideal for use in space-constrained, high-data-rate applications including IoT devices, printers, compact power devices, scanners, and external storage devices. The new I/O connectors can support data speeds up to 480Mb/s in USB 2.0 applications are available in vertical and right-angle configurations molded in LCP plastic compatible with IR reflow and wave soldering and operating temperatures extending from -55°C to 85°. The series also features contacts plated with 30uin of gold to support a peak current rating of 1.5A per contact, a frog leg shield-pin design that increases stability during the soldering process and throughout the product lifecycle, and through-hole terminations. Hirose extended the current-carrying capacity of its compact and low-profile DF60 Series wire-to-board connectors, which are part of its EnerBee Power Connector Family, to support automotive, industrial, medical, power conditioning, robotics, and telecom applications that require current ratings up to 65A. The series is available in straight, right angle, and in-line configurations with a 10.16mm pitch, three keying variations, five-point contacts with independent contact springs to ensure secure connectivity and high-reliability performance in harsh environments, audible mating confirmation, and a unique locking mechanism contained within the connector header. It is also available in a touch-proof variation designed to prevent electrical shock (DF60F). The series accepts 12–8AWG cables, is rated for 1,000VAC/DC and operating temperatures extending from -55°C to +105°C, and is RoHS compliant, with UL and TUV pending. Cinch Connectivity Solutions expanded its Cinch Mil/Aero Circulars Series with the addition of the new DMS-TP™ Series connectors, which are specifically designed to meet industry requirements pertaining to watertight products in harsh-environment applications. The new DMS-TP Series is waterproof when temporarily submerged at depths up to 300m, is resistant to corrosion, and provides ease of use with scoop-proof shells, and its nickel-plated brass shells enable prolonged use in the presence of oil, gas, sand, mud, hydrocarbons, and salt. The Cinch Mil/Aero Circulars Series offers a full range of frequencies, insulation resistance, dielectric withstanding voltage, operating voltage, and capacitance, is available with hermetic sealing in any circular connector configuration, and offers glass, ceramic, and epoxy-sealed packages designed for use in critical harsh-environment applications where leakage must be prevented even under extreme changes in temperature, pressure, humidity, and intense vibration, like oil and gas equipment. TE Connectivity ’s new BUCHANAN WireMate Inverted Through-Board (ITB) wire-to-board connectors feature user-friendly poke-in and wire release features that reduce installation time and enhance flexibility for reuse and wire replacement. Ideal for linear and circular LED modules employed in all sorts of commercial and industrial lighting systems, the series doesn’t require any crimping or soldering to attach wires and, once inserted, strongly retains wires to prevent inadvertent pull-out; although, a robust integral release feature allows for rework if required. The new WireMate ITB connectors also have a low profile, measuring only 2mm in above-board height when mated, and are designed for horizontal wire insertion, which minimizes space usage beneath the PCB. The series has a maximum voltage rating of 320V, a current rating of 6A for 18AWG wiring and 5A for 20AWG and 22AWG wiring, and molded PPA casings designed to withstand high-temperature SMT soldering. It is also modular in design, offering up to five wire connections in different colors to help prevent mismating, and conforms to the UL 1977 standard for component connectors employed in data, signal, control, and power applications. SCHURTER ’s new Series 4751 IEC Style-F outlets enable quick, easy assembly, increased functionality, and safe operation in power distribution units and uninterruptible power supplies employed in data centers and other information and communication technology. The outlets are available in two-, four-, and six-pack configurations that are prewired between outlets to hasten of assembly and in black, gray, and white to support cluster distinction in multi-phase applications, and are certified by VDE and CCC for 10A at 250VAC and cURus approved for 15A at 250VAC. Terminal options include common 4.8mm x 0.8mm solder terminals, common 6.3mm x 0.8mm quick-connect terminals, and independent, prewired neutral and ground terminals. The outlets’ snap-in mounting mechanism is designed for standard 1.5mm panels, but can be made to suit 1mm or 3mm panels upon request, and their panel cutouts are keyed to ensure proper mounting and alignment and further ease assembly. In addition, the series is compatible with V-Lock retaining cordsets and SCHURTER’s new tamper-resistant Series BC320 Blind Cover outlet accessory, which is designed to manage system loads by blocking individual outlets from use and, for safety reasons, requires a special tool for removal. Amphenol RF added several new thread-in mount jacks, a straight cable plug, and a bullet adapter to its popular high-frequency, subminiature SMP product line, which operates at DC to 26.5GHz and is ideal for blind-mate applications that require a high-data-rate transmission and a variety of board spacing and package size options, including broadband, instrumentation, and telecommunications applications. The three new 50Ω SMP straight jacks feature a thread-in bulkhead design with post contacts and push-on coupling mechanism, are constructed with gold-plated brass, and are available in limited detent, full detent, and smooth bore interfaces. The new straight solder plug is optimized for 0.047” semi-rigid cable, features an anti-rock ring for vibration resistance and the familiar push-on coupling style, and is constructed with gold-plated beryllium copper. The new SMP plug-to-plug bullet adapter is designed to compensate for both radial and axial misalignment and is now available in 17.16mm length. Ironwood Electronics ‘ new high performance, 27GHz bandwidth, epoxy-mounted socket (SG-BGA-6484) supports 1mm pitch, 11x13mm body ICs without compromising performance in very-high-speed memory applications and easily supports very dense BGA devices with a high-performance conductive elastomer contactor. The sockets have a precision design that guides ICs to the exact position for each ball’s connection, an open-top socket lid that provides compression force, an integrated epoxy band around the perimeter that enables solderless mounting, eliminates mounting holes, and requires only 1.25mm of perimeter space on the target PCB, and special grooves on the socket wall for additional retaining strength. They accommodate IC packages including Micron’s flash memory BGA packages, 1mm-pitch BGAs, and 8×8 ball arrays, typically exhibit 20mΩ of contact resistance, and enable easy contactor replacement after hundreds of cycles. PROVERTHA ’s new M12 Mini is the industry’s most compact M12 cable connector. Designed to provide reliable data and signal transmission in space-constrained fieldbus applications, the M12 cable gland has an all-metal housing that ensures effective shielding, measures 44mm in length, has a small outer diameter of 16mm or 14mm, offers a large cable clamping range of 4–9mm, and has a solid and fully shielded strain relief. It is available in the A-5, A-8, B, and D codes, features an M12 locking nut with hexagonal combination knurl to enable easy tightening of the screw connection to a defined torque, as well as IP67 screw-locked sealing, and accepts single 28–18AWG wires via machined snap-in crimp contacts. It is also rated for 2–4A, operating temperatures extending from -40°C to +85°C, and more than 250 mating cycles. Cambridge Electronic Industries released its first range of connectors designed for automated pick and place manufacturing. The new Rapid ConneXions range is part of the popular CoaxVision™ precision 75Ω portfolio and includes right-angled and end-launch BNC and Micro BNC connectors. All of the connectors in the new range are specifically designed for automated PCB placement in rapid assembly and volume production environments, are 12G-SDI and CXP-12 compliant, and are fully compatible with reflow processing. They also have two locking posts that locate the connectors during processing, an optimum center of gravity for automated placement machines, and an insertion force of less than 8N, and are available with different PCB locking post lengths to suit variations in board thicknesses and with pin-in-paste posts that are designed to enable the electrical termination of the connector body, add extra stability in process manufacturing environments, and avoid protruding through PCBs. The BNC connectors in the range can be supplied individually or in pick-and-place waffle trays of 36 connectors, while the Micro BNC connectors can be supplied individually or on tape and reel in 650-piece quantities. Rosenberger has developed a wide range of waveguide-to-coaxial adapters to enable efficient, low-loss transmission up to 110GHz between the waveguide and the coaxial connector. The spectrum includes straight and right-angle adapters with round or rectangular flanges in SMA, RPC-2.92, RPC-1.85, RPC-1.35, and RPC-1.00 coaxial interfaces and covers a frequency spanning 7.05–110GHz (i.e., 11 waveguide bands spanning WR 112 to WR 10). Amphenol RF expanded its popular N-Type Connector Series with the addition of new 18GHz N-Type connectors designed for use in rugged outdoor application that require low-PIM performance, durability, and fast data transfer rates. The medium-sized connectors have a ruggedized, single-body construction that employs the series’ familiar threaded coupling mechanism and provide engineers with reliable, durable, and weatherproof interconnect solutions that deliver excellent low-PIM performance, fast data transfer rates, low VSWR and insertion loss, and high power handling. The new connectors are fully interchangeable with N-Type connectors made to the MIL-C-39012 specification and are ideal for use in wireless infrastructure, military, and industrial applications where reliable RF and mechanical performance is critical. Ironwood Electronics’ new open-top spring-pin socket for 1mm-pitch BGA devices (SBT-BGA-6044) meets rigorous performance requirements for burn-in and test applications. Its stamped spring-pin contactor is rated for 4A at 80°C temperature rise, 19g of actuation force per ball, 0.93nH self-inductance, less than 1dB of insertion loss at 14.1GHz and 0.097pF capacitance, operating temperatures extending from -55°C to +180°C, and 125,000-cycle durability. The socket also features a floating guide for precise ball-to-pin alignment and an integrated compression plate that has a center opening for accessing device top surfaces. TE Connectivity launched a new line of Raychem CANbus (controller area network) cables featuring ruggedized constructions that reliably withstand various harsh-environment conditions and the ability to transmit data at speeds up to 1Mb/s. Designed in accordance with SAE J1939 requirements, the new high-speed copper cable portfolio offers cables compatible with SAE J1939-11 and SAE J1939-15 requirements for military ground vehicles, in addition to designs that cater to marine and aerospace applications. The high-performance, 120Ω twisted-pair cables are easier to terminate than tape-wrap designs, offer a variety of conductor, dielectric, core wrap, shielding, and outer jacket material choices rather than a one-size-fits-all solution, and are rated for operating temperatures extending from -65°C to 200°C, depending on construction. They are also flexible enough to enable easy routing, resistant to abrasion, and available in both shielded and unshielded versions. Custom cables are available upon request. NAI introduced a series of new fiber optic cable harnesses designed specifically for hyperscale computing in data centers. The new fiber optic cables are pre-terminated at one end with LC or MPO connectors (although customers can specify any fiber optic connector) and then spooled onto a crate reel at customer-specified lengths. NAI recommends a minimum length of 50 feet, and the length limit is generally defined by the reel dimensions required for safe handling and transportation. The pre-terminated end solutions reduce field terminations and ease installation in cramped data centers, and are currently available with 288, 576, 1,728, and 3,456 fibers. The series’ pliable single-mode ribbon cable is OFNR-Riser-rated and ideal for high-density space requirements, its flame-retardant PVC sheath provides a rugged yet flexible cable for indoor riser applications, and its UV-acrylate-coated fibers are color coded per TIA-359 and TIA-598. Each fiber ribbon consists of 12 primary fibers aligned in parallel, each ribbon is intermittently separated for pliability, and all ribbons are placed in a single, non-filled, flame-retardant PVC buffer tubes and then covered by a cable sheath that consists of a layer of fiberglass yarns and a layer of rigid FRP strength elements to achieve the tensile strength required for installation and service loads. In addition, the PVC jackets are colored yellow for single-mode designation. AFC Cable Systems’ new Splash Zone Liquid-Tight Conduit features a moisture-, oil-, and sunlight-resistant polyvinyl chloride (PVC) jacket that inhibits bacteria growth and resists degradation resulting from washdowns with bleach agents and is available in metallic and non-metallic options. Ideal for use in food industry applications including food processing, meat packing, and restaurants, the new conduit allows food manufacturers to clean and sterilize using bleach without the risk of product degradation. It is also UL approved, CSA Listed, and an NSF® 169 Component, which means that it meets or exceeds standards for material safety, design, construction, and product performance in the food industry. L-com, an Infinite Electronics brand, released a rugged new line of Category 7 cables that are ideal for 10GBASE-T, Cat7, Cat6a, factory automation, industrial Ethernet, machine vision, and outdoor applications. The new Cat 7 cables employ halogen-free TPU cable constructed with an overall braid shield around individually shielded twisted pairs (S/FTP), feature ruggedized, die-cast metal RJ45 connectors on each end, are rated for 10Gb/s Cat 7 performance, and are oil-, UV-, and flame resistant. They also have excellent flex characteristics with a bend radius of 1.39” and come with an optional unified GigE bracket with 2mm and 4mm spacers that enables the easy modification of the metal RJ45 connectors into horizontal or vertical GigE configurations compatible with either of the common machine vision standards. The cables have a temperature range rating to +60°C and are offered in off-the-shelf lengths of 1, 2, 3, 5, and 10 meters. TE Connectivity ’s BATTU dual-wall heat-shrink tubing is a semi-rigid, flame-retardant solution especially designed for power cable to terminal applications in harsh environments, including commercial vehicles and industrial equipment. The tubing consists of a polyolefin jacket that meets ISO6722 flammability requirements and a polyamide inner adhesive wall capable of bonding to a variety of substrates. It has a 2:1 shrink ratio designed and sized for rapid application and reliability, helps hasten assembly, offers a degree of strain relief, and has the potential to reduce applied costs. It also provides electrical insulation and mechanical protection from abrasion and bending, resists moisture including automotive fluids, and withstands operating temperatures extending from -40°C to 130°C. The tubing is available in six convenient cut lengths to help prevent splitting that could result from improper cutting (32, 39, 51, 64, 77, and 102mm), accommodates 6–4/0AWG cable, is rated for 600V with 19,700V/mm dielectric strength, and is compliant with UL E85381. Optical Cable Corporation’s (OCC’s) new customizable Forge Fan-Out Kits facilitate the frequent deployment of high-density, small-outer-diameter fiber connections capable of withstanding challenging indoor and outdoor conditions in applications including audio and video production, satellite uplink connections, and enterprise data networks. Designed to reduce the degree of difficulty associated with making individual fiber terminations, as well as the possibility of making faulty connections, the kits allow stripped cable fibers to be individually secured in modular fan-out insert pucks with up to 48” inches of pre-secured furcation tubing and can be self-installed or factory pre-installed on a cable. The two-piece clamshell housing design minimizes the risk of damaging fibers during installation, provides maximum fiber protection, and is currently available in 4-, 6-, 8-, 12-, and 24-fiber models with all tubes in yellow, orange, or aqua to indicate the fiber type, or with each tube color coded per TIA to support quick fiber identification. Indium Corporation’s new TACFlux® 066HF is a water-soluble halogen-free (ORH0) hand soldering and rework flux that is compatible with typical tin/lead and lead-free alloys for PCB assembly applications. Benefits include outstanding wetting performance in air and nitrogen atmospheres, a shelf life of up to six months, and halogen-free composition per IEC 61249-2-21 test method EN14582. Bulgin released the new slimline SL Series photoelectric sensors, which provide flexible, cost-effective proximity sensing solutions in manufacturing and industrial automation equipment to support the implementation of the Industrial Internet of Things (IIoT). The SL Series delivers valuable space savings with a slim, but strong stainless steel 316 form factor that measures just 30mm x 16mm x 4.5mm and provides an IP67 waterproof and dustproof seal to any standard M5 connector interface, rugged resistance against shock and vibration, and a high degree of electrical stability. It is available with or without an M5 connector and with 2m cable lengths. HARTING ’s Edge Computing MICA® for industrial and transportation applications now comes with a secondary Ethernet interface that can be used to easily exchange and process data between two Ethernet protocols, including wired-to-wireless gateway applications and Industry 4.0 applications, and especially those that wish to block external applications from direct access to a corporate network. The secondary Ethernet interface is provided via the functional circuit board and further expands the modular MICA Wireless platform, which already offers WLAN, BLE, and LTE connectivity, enabling an array of compact, easy-to-manage solutions. Now, the Edge Computing MICA can act as a wired-to-wireless gateway for collecting maintenance data from programmable logic controllers (PLCs) and sending relevant events to machine manufacturers or maintenance services, as a processing node for RFID readers connected via WLAN, as a remote systems monitor capable of transmitting data as needed and in a compressed format worldwide via LTE, and as a Bluetooth Low Energy (BLE) to Ethernet gateway in applications including railway embankments. An additional USB interface can also be used to add further capabilities or a USB storage device since, unlike a router, MICA (modular industry computing architecture) can carry out complex data transformations and aggregations. Like this article? Check out our other Product News, Industry News, and Product Roundup articles and our 2019 Article Archive.